L.C. Power, a 97-year-old World War II veteran, knows the pain of war. The Louisville resident received three Purple Hearts and a Bronze Star for his service in Europe during World War II. But, for the then-27 year-old in 1943, the worst pain came in leaving his young family, including his few-days old son, Michael, and wife Nadine. “We brought him home from the hospital on Sunday afternoon, and I left on Monday,” he recalled. His first taste of battle was monumental, as he joined the thousands who stormed the beaches of Normandy. “The boats came in and we jumped out into bloody water up to our waists, and soldiers all around us on the ground,” Power said. He survived the Normandy invasion – including being left behind in a foxhole by his company the next morning – to head deeper into Europe. Shortly thereafter, he sustained the first of three gunshot wounds he would survive during his tour of duty. “It doesn’t hurt to get hit; it’s just like a bee sting,” Power said. “But, then it hurts the next day, of course.” After recovering from his first injury, where he was shot in the foot, Power was involved in several decisive battles, including the Battle of the Bulge. “That was a big one,” he recalled. “We had 91,000 soldiers injured at the Battle of the Bulge.” He was in the midst of the fight when he was spun around and knocked to the ground. “My face got hot and I put my hand to my ear and thought, ‘Oh no, I got it again.’” Later, near the end of the war, he was wounded when his machine gun was shot out of his hands. After returning from his recovery in France, Power was involved in an incident that won him a Bronze Star. Acting alone, he set up his machine gun in preparation for a coming battle. He noticed a small structure that he discovered was full of German soldiers and each time they would look out the door, Power would fire his weapon. After multiple cat-and-mouse rounds, 13 German soldiers emerged, waving white flags. When he returned home after the war, Power raised his family and spent many years as a milkman for CreamTop Dairy. In his sunset years, he is still active and spry, defying his 97 years. As a veteran, he is a true treasure. As the number of living World War II veterans rapidly dwindles, it’s more important than ever to preserve the stories and celebrate the lives of these heroes who sacrificed so much. As the U.S. celebrates Veteran’s Day on November 11, the numbers are worth contemplation. Nationwide, only 1.4 million of the original more than 16 million World War II veterans remain. The more sobering statistic is that, according to the Department of Veterans Affairs, 600 World War II veterans die each day. Recently, L.C. Power was honored along with dozens of other wounded warriors of all wars, including recent conflicts, at the Tribute to Troops Wounded Warrior Project benefit. 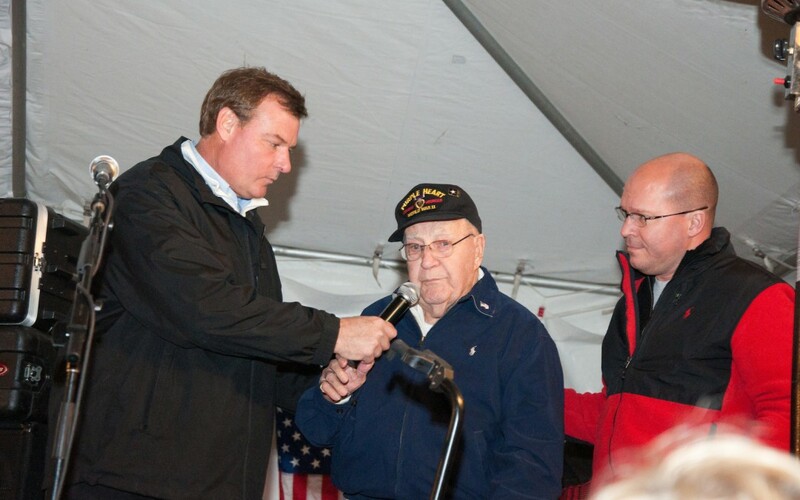 The event, the brainchild of Mike Greenwell, owner of Titan Marine off U.S. 42, featured dinner, a silent and live auction and dancing to four bands, all in honor of service men and women wounded during active duty. Greenwell, working with a volunteer board and more than 35 sponsors, including Sysco Foods, Tumbleweed, Power Creative, Kroger and the Waterfront Development Corporation, produced the inaugural event. The goal was to celebrate the veterans and connect civilians to the veterans and their stories. The highlight of the evening was the boisterous arrival of more than 80 wounded warriors from the Warrior Transition Unit at Ft. Knox. Several Oldham and Jefferson County police, fire and sheriff’s department members, along with the Freedom Riders motorcycle group, escorted the Warriors from Ft. Knox to the event in Oldham County with lights and sirens blazing. The veterans arrived to continual applause and standing ovations from the large event crowd. An emotional meeting between L.C. Power and the Wounded Warriors followed. The U.S. Army established Warrior Transition Units (WTU) at major military treatment facilities around the world, including Ft. Knox. The WTUs provide personal support to wounded soldiers who require at least six months of rehabilitative care and complex medical management. Programs include personalized medical management, goal setting, education and employment counseling, family support, and adaptive sports and reconditioning programs that help soldiers achieve their physical fitness goals and supplement their therapy. The Ft. Knox Warrior Transition Unit provides leadership and primary care that enables wounded, injured and ill soldiers return to duty or successfully transition to civilian life. The Unit has about 450 soldiers currently in the program at Ft. Knox. The veterans are called Soldiers in Transition and see that their job is to heal and continue serving the nation as a veteran in his or her community. All soldiers develop a comprehensive transition plan that includes personalized goals that allow the soldiers and their families to move forward toward life post-injury. Nationally, the Wounded Warrior Project works to honor and empower wounded and recovering soldiers. Its main purpose is to raise awareness and enlist the public’s support for the needs of injured veterans. It also provides services including caregiver retreats, combat stress recovery programs, career and education services, and adaptive sports and recreation activities. The little baby, Michael Power, who saw his father off to war at just a few days old, recently turned 70. He joined his father, L.C., and other members of the Power family, including grandson, David, on stage at the Tribute to Troops benefit. The outpouring of support and gratitude shown to L.C. Power overwhelmed the entire family. The Tribute To Troops event enjoyed raging success, with over 700 in attendance and $75,000 raised. Planning will get underway soon for the second annual event. More information can be found at www.WoundedWarriorLou.org. “I told the Lord, if you get me home, I’ll work for you, and I did,” said Power. In addition to his full time and two part time jobs, Power volunteered at his church, Kenwood Heights Christian Church, for 45 years. His hard work put his children through college at the University of Louisville and no doubt fueled Power’s indomitable spirit. “It’s been a very good life,” he smiled.